Winter brings many wonderful things, however, with it can come dry, cracked, flaky, and painful hands. Our therapeutic hand cream is a comprehensive blend of carrier and essential oils that nourish, hydrate, soothe, and relieve your chapped winter skin. Lavender, geranium, chamomile, coconut, avocado, and shea work to protect, repair and restore your skin. 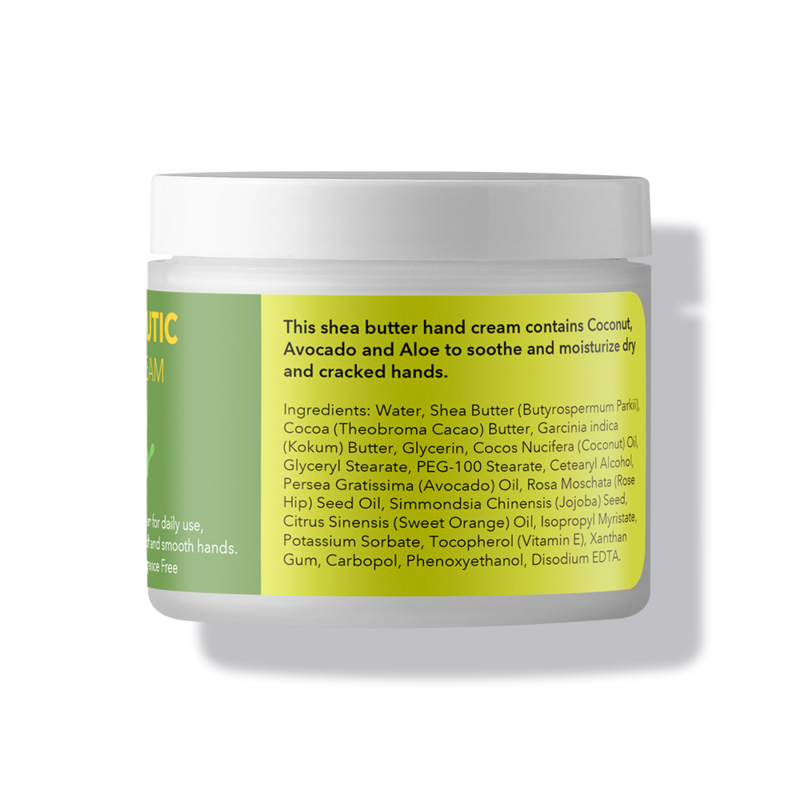 Our healing hand cream is non-greasy and fast absorbing. It is pure and gentle enough for sensitive skin since we leave out parabens, artificial fragrances, and dyes, for nourished and hands all winter long. Massage a quarter-sized amount of hand cream into skin for best results. Avoid applying to skin with open cuts or wounds. 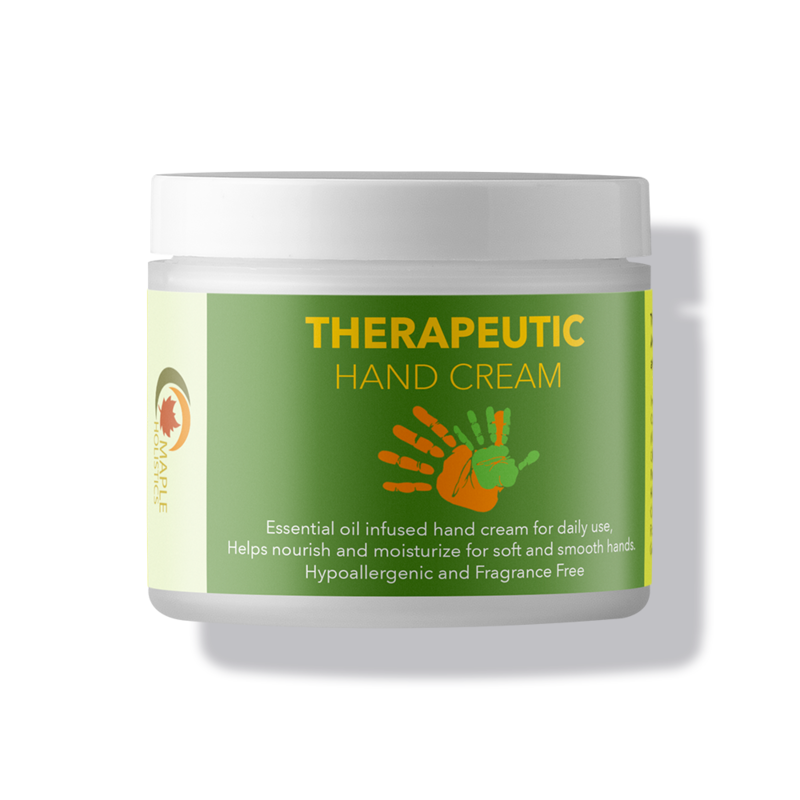 Aqua, Shea Butter, Aloe Barbadensis Leaf Juice, Vegetable Glycerin, Avocado Oil, Organic Virgin Coconut Oil, Lavender Oil, Geranium Oil, German Chamomile Oil, Vitamin E.
This cream is wonderful for hands! It has a whipped texture that blends in the skin quickly and a mild floral scent that is delicious. Provides a lasting moisture and smoothness to the skin. I was initially interested in this hand cream because it has natural ingredients. Now that I’ve used it, I am loving how it moisturizes my hands without making them greasy. It takes just a few seconds for the cream to be absorbed and it leaves my hands really soft. This cream has a nice light scent which I really like. I would definitely recommend this hand cream! Oh my goodness, this cream is so soft & luxurious! I love the way it feels, a little goes a long way & it is long lasting. My husband really likes it as well. The scent is mild & fresh, so it’s very appropriate for everyone. I personally like to add a little bit of my Maple Holistics lavender essential oil to it for a stronger scent. I have not been disappointed with anything I’ve gotten from Maple Holistics & they are really a pleasure to work with! Thank you for such great products! As a letter carrier I am out in the weather as you can imagine so I’ve tried countless hand creams (lotions) and I have to say this is the best stuff I’ve found for my poor hands. This is so creamy and hydrating. It makes my hands so soft and has a very mild but pleasant scent.